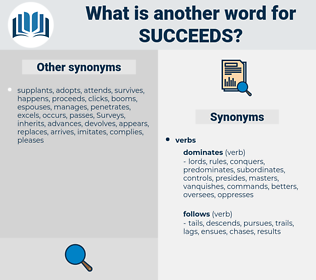 What is another word for succeeds? 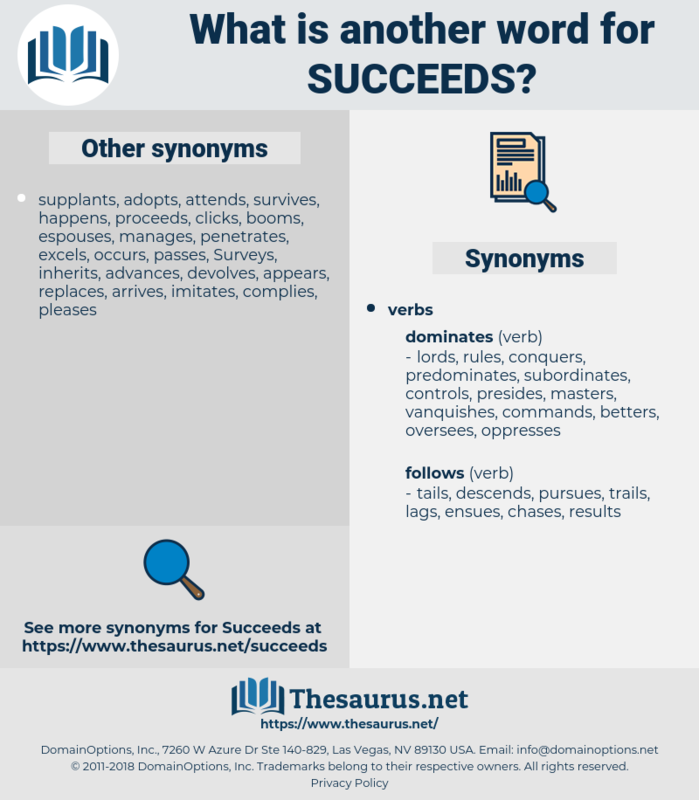 successes, supersedes, supercedes, substitutes, accomplishes, secures, displaces, acquires, achieves, concludes, prospers, culminates, replaces, Guarantees, proceeds, luck, ensures, manages, results, captures, fails, Flourishes, transpires, assures, delivers, sums, germinates, calculates, ends, facilitates, thrives, triumphs, proves, earns, generates, completes, attains, prevails, empowers, reaches, produces, Gains, serves, arises, adopts, overrides, collects, helps, yields, entitles, occurs, follows, enables, obtains, passes, leads, entails, creates, receives, affords, works, increases, arrives, Comes, finds, operates, Strikes, implies, Permits, applies, moves, binds, hits, wins, allows, lets, Does, pulls, runs, keeps, means, goes, gets, makes, causes, kills. No one of course likes to be crushed; in families especially when the one succeeds, the others do not like it; that is only natural. It is here that the Franklin breaks in, and in the most courteous and charming manner succeeds in checking the story, of which the pilgrims have evidently had as much as they want, and in skilfully leading up to his own tale.